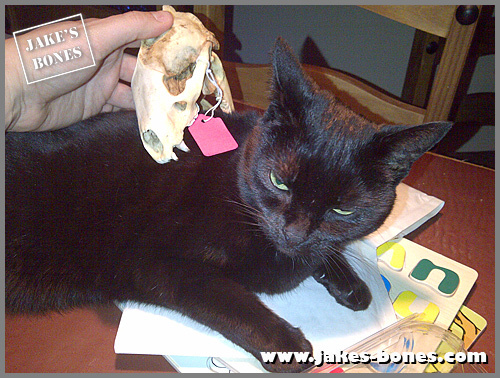 You are here: Jake's Bones > So which suspect is guilty of biting Pharoah ? 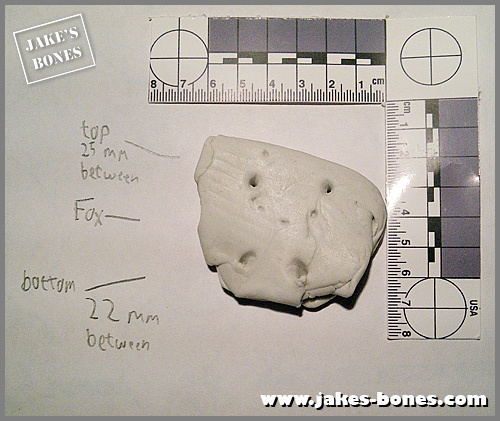 This is the third and last post almost the last post (see my note at the end) that I am writing about Pharoah the fox skeleton that I originally found in Northern Ireland in 2009. Two weeks ago I wrote about rotting the mummified body down to get the skeleton, and last week I wrote about what I found when I examined the bones. Pharoah had a tough life. Last week I wrote about how I thought he had damage to one leg, arthritis in one knee, he had lost a lot of upper teeth through some kind of damage (vets call it trauma) and one of the most interesting things was damage to the left shoulderblade which I think I have worked out was an old bite mark that had rehealed. I will never now for sure if I'm right, but I thought it might be interesting to see if I can work out what animal had bit Pharoah the fox, causing the bite mark. 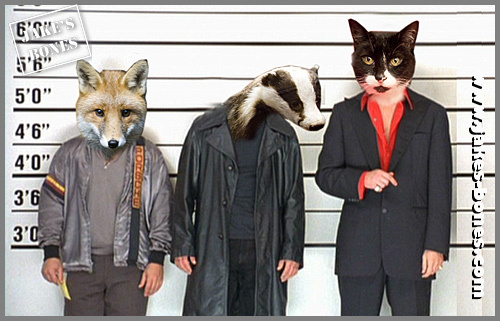 So this week's post is about me doing a kind of scientific experiment to work out which suspect was to blame ! 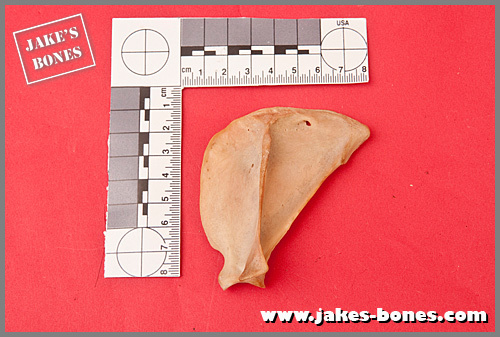 This is the damaged shoulder blade with the two holes either side of the ridge at the spine side at the top. 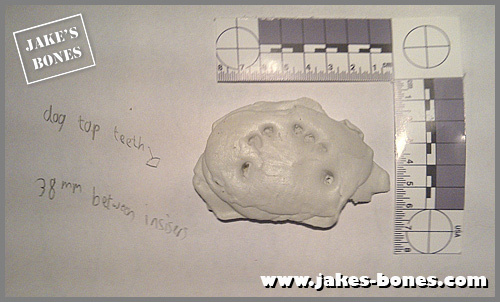 The holes were 25mm apart, so they looked like they had been made by the canine teeth, which are the bigger ones either side of the incisor teeth at the front. This is how I tested each one by pressing their canine teeth into soft Blu-Tac, taking them out and measuring the distance between them, I had to do this for both top and bottom canine teeth. Why it's a suspect: Because dogs have big canines, they are often bigger and stronger than a fox, they can get walked off the lead by owners in fields where foxes might be (some dogs are even trained for fox hunts). Why it's complicated: dogs come in all shapes and sizes, so there are tons of different breeds all with different bite marks. My only dog skull is from a bigger dog but I don't know what type, and don't have the lower jaws. The gap between the top canines was 38mm which is too big for this particular dog to have made the bite mark. Conclusion: it might have been a smaller or younger dog but would a smaller dog want to attack a fox ? Why it's a suspect: Because cats can be quite aggressive if cornered and they can't get away. Last week my dad saw a 30kg Staffordshire bull terrier which had almost been blinded by a 4.5kg cat ! 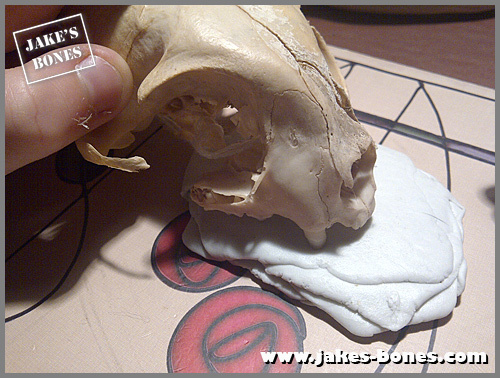 What are cat skulls like: They are small versions of lions ! They are different breeds but they are mostly the same. I have four cat skulls and they are almost all identical sizes. 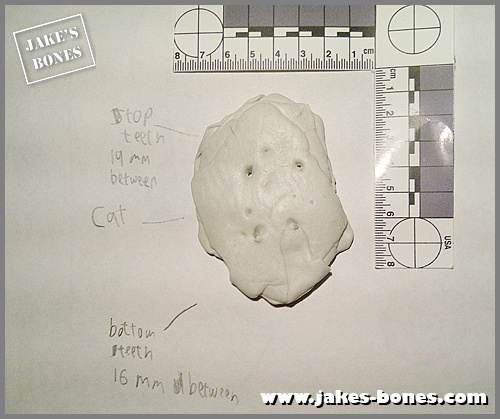 Conclusion: Even if a cat was brave enough to attack a fox the gap between the teeth is far too small at 19mm or 16mm. Why it's a suspect: Badgers may look soft and gentle but they have massive powerful jaws and they are they are one of the few UK mammals where the bottom jaw is connected to the skull in a hinge. which means they can bite as hard as possible without dislocating the jaw. Badgers that are attacked by dogs can cause a LOT of damage. 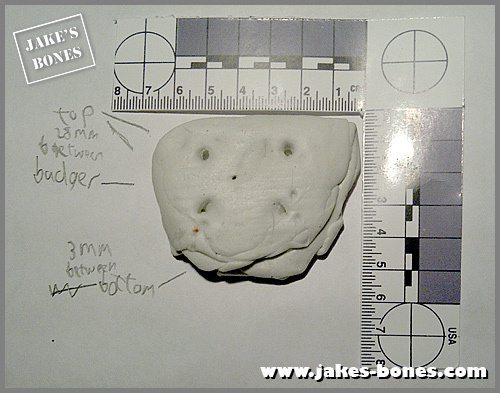 The badger's bite was 28mm between the top canines, and 30mm (not 3mm !) between the bottom ones, which is just a bit too big. A younger badger with a smaller mouth might have done it. Conclusion: It seems unlikely a fox or a badger might attack each other but it is possible. But a badger's strong bite might explain the amount of damage. 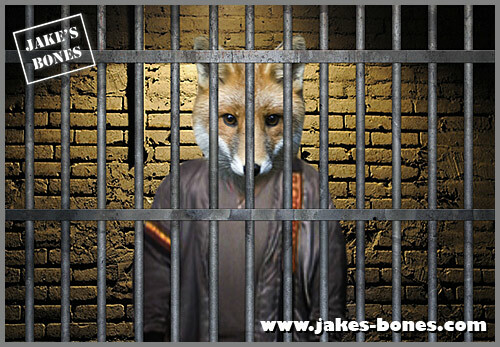 Why it's a suspect: Foxes live in the wild and compete for food. BBC Springwatch had a series of film clips about foxes that lived in a landfill site and how they would fight each other. Foxes have long thin canines. 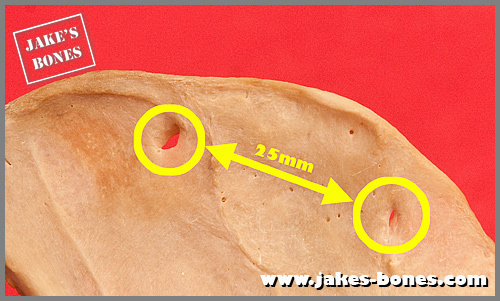 The gap between the top canines was an exact match at 25mm, and the gap of the bottom canines was smaller at 22mm. Conclusion: There is strong evidence that Pharoah was attacked by another fox which bit it across the shoulders with the attacker's head facing the opposite way to the way shown in my picture above of my cat. I think the most likely suspect is another fox. 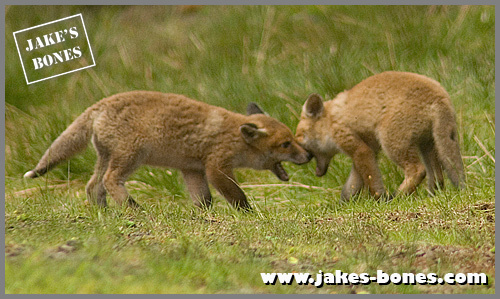 Last year Dad photographed fox cubs fighting each other as part of their play. They do this to work out which is the dominant (strongest) one between themselves. You can see them here trying to wrestle each other. The injury could have happened when a cub but I think it more likely it happened with another adult because of how big the jaws would need to be to do the bite. The injury is well healed so it didn't cause the death, but it was still pretty nasty. Your cat does not look happy ! Loved this post! The pictures and your detective work are great. Can't wait to see what Ben has to say next week. @Anon: she wasn't too happy about it ! @CBW AND Jack: Thanks ! Rat's front incisors are close together, small and chisel like. Doesn't sound like a rat !